Summer’s fast approaching and many of us are closely watching our diet, working overtime to lose any extra fat we accumulated over the winter. Swimsuit season will soon be here, so now is the time to lean up. It’s not unusual for fit, healthy people to be more conscious of carbohydrates than any other macronutrient. 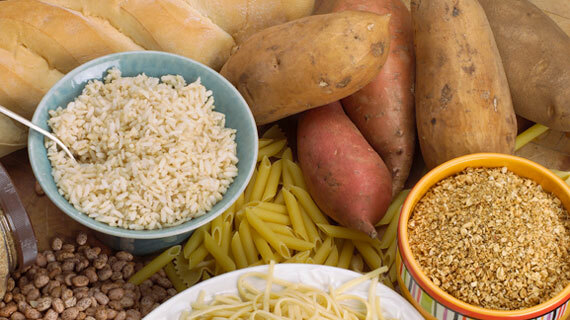 Overeating carbs can definitely pile on the body fat. This is especially true of simple sugars found in candy, cookies, cakes, processed food, soda and fruit juices. But even complex carbs like bread, rice, pasta and potatoes are often eliminated or severely cut back on during a cutting phase. If you’re one of those dieters who feels like you just can’t get to a low level of body fat without cutting out all carbs, remember that carbohydrates do serve a purpose. They are the primary energy source when stored as glycogen in muscle cells. Glycogen fuels anaerobic workouts including weight lifting. Try to schedule one high carb day at least once a week. That’s the day you’ll consume twice as many grams of carbs as a typical dieting day. It’s more than just a break from the routine. This increase in carbohydrates will help restore muscle glycogen levels and helps boost your metabolism, sending the body into fat-burning mode. A low carb diet followed for too long tends to slow down your metabolism. Increasing carbohydrate intake just once a week will work wonders for your beach body goal.